When Orhan Pamuk introduced the concept of "hüzün" (melancholy) as the overarching sentiment in Istanbul, there were, understandably, many detractors, as the joy of the city hardly corresponded to the melancholy described in his "Memoirs of a City." In Kaya Genç's collection of Istanbul travel writing penned by Europeans and Americans, mostly in the late Ottoman period, there seems to be little space for melancholy. There is instead a plethora of sights, sounds and smells that keeps both the traveler and the inhabitant alert to both the immediate and the transcendent. The book is divided into themed chapters that contain short passages from different travel writers. This helps the reader get different points of view of the same theme such as "Gardens" or "Holy Places." Apart from the more obvious chapters such as "Imperial Life and its Pleasures" and "Ramadan in Istanbul," there are chapters titled "The Darker Parts of the City," "The City as Hell" and my favorite - and I say this as a non-smoker - "Caffeine and Nicotine," as this chapter leads us to an understanding of the concept of "keyif" (delight), spelled "kief" by Edmondo de Amicis, who elaborates on it at length. In any anthology covering Istanbul travel writing one does a quick checklist of the usual suspects and looks for new finds. As expected, Gautier, de Amicis, Nerval and Montague are there along with special guest appearances from Herman Melville, Ernest Hemingway, Mark Twain, Hans Christian Andersen and Conan Doyle. Clearly designed to add a fourth historical and/or literary dimension to the sightseeing of the seasoned traveler, the anthology will lead booklovers by the nose to their source texts. Naturally, the writers' own preoccupations are reflected in the way they see Istanbul. Melville talks about compasses, Twain sees the idlers, packs of dogs and the beggars, Hemingway explores the town of the "after hours" while Andersen sees a scene from Aladdin's story as he observes Ottoman pomp. It is generally known that Sultan Abdülhamid II loved the Sherlock Holmes stories - one guesses the contemporary craze would be of no surprise to the sultan, and he would have approved - but this reader did not know that Doyle had actually come to Istanbul. Genç informs us: "During the Young Turk revolution that shook his authority, Hamid read aloud Doyle's stories in order to remain calm and not hear the protestors outside his palace." Devout Muslims who read the anthology would envy Doyle's privileged entry to the Hagia Sofia Mosque in the evening of the Night of Power, "Kadir Gecesi" in Turkish, when it is believed the skies received the Quran in its entirety. Although in many ways it is conceived as a literary guidebook, the book offers pleasures for long time inhabitants of Istanbul as well, as it helps them see the place they cherish anew. In "The Sea and the View" chapter there are beautiful references to the Istanbul mist. Current residents will concur that the morning mist, and indeed, the positioning of clouds and strength of sunrays act like unpredictable Instagram filters for Istanbul. Even the geography of the town is in constant movement, and there seems to be innumerable possibilities for the eye to be deceived. It also helps one hear Istanbul anew, to learn what sounds you have grown up with or have been exposed to for a long time sound to strange ears. Hemingway likens the rhythms of the call for prayer to "an aria from a Russian opera," and says it bears "the magic of the East." Genç opens his collection about travel writing on one of the most fabled cities of the world with writing from one of Europe's most fabled characters: Giacomo Casanova. The Casanova section in the chapter sets us firmly in the Byzantine and Roman historical background of the city. We get a sense of the cityscape's mesmerizing effects on those who see it for the first time be they Venetian courtiers or Roman emperors. There are indeed several comparisons to Venice, the maritime power that the Ottomans continually vied for power with in the Mediterranean. The comparisons remind us that Ottoman Istanbul was a city on the water in a more immediate way than contemporary Istanbul is. The connections between different parts of the city were organized through waterways, the Bosporus and little rivers opening up into the strait, some of which, like Büyükdere, have now been closed and built over. The most pungent comparison with Venice comes, naturally, from that famous choleric figure, Andre Gide: "Constantinople justifies all my prejudices and joins Venice in my personal hell." We read with glee that the things he hates Istanbul for, most of all its eclectic nature, are the very things that endears it to us. The Turkish cafe on the Boulevard du Temple has given Parisians a false idea of the luxury of the Oriental cafes. Constantinople is very far from indulging in such wealth of horseshoe arches, slender columns, mirrors and ostrich eggs. Nothing can be plainer than a Turkish cafe in Turkey. I shall describe one considered to be one of the finest, yet in no way recalling the luxuries of Oriental fairyland. Though Gautier seems to be disappointed, no doubt comparing Istanbul cafes with facsimile cafes in Europe, he goes on to describe several items of what one would still consider oriental design. The differences between the cafes described by Gautier and Nerval reflect to a certain degree the differences you can still see today. One has a marble fountain in the middle, in the other "everything is served in the French manner." Another nice touch is having Hemingway describe a "poisonous, stomach drink" that has "a greater kick than absinthe," which he calls deusico - a word only used by Hemingway, it seems, if we are to trust Google - and which, the context suggests, is nothing more than your usual Turkish coffee. In the same chapter the American traveler Harrison Griswold Dwight takes issue with the amount of time Turks, a driven nation that marched all the way to Vienna, he says, now seem to spend just sitting sipping coffee. These authors are, of course, writing at a time when tea had not yet become the fuel on which Turkey runs - hard to imagine now while walking the streets and bazaars in Istanbul. To have eaten sparely, to have drunk a cup of pure water, to have prayed, to feel the flesh in repose and the conscience tranquil, and to be somewhere whence can be seen a vast horizon, under the shade of a tree, following with the eye the flight of doves from a neighboring cemetery ... and the smoke of shisha, vaguely rumination upon God, on death, on the vanity of earthly things, and the sweetness of eternal rest; this is kief. To be a quiet spectator on the world's great theater; this is the Turk's highest aspiration. 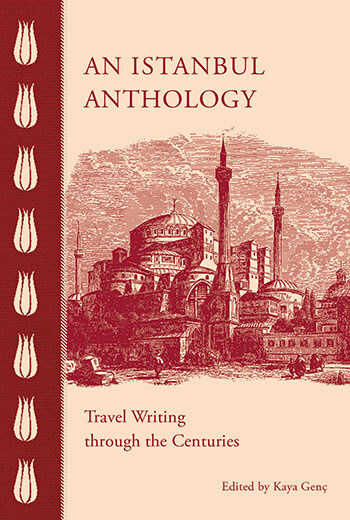 As a chronicle and guidebook to all the likely and unlikely things that will give keyif in Istanbul, reading the anthology becomes a part of that joyful experience; both as a window unto the Istanbul of yore that still persists in pockets today, and a wide variety of authors we should revisit and/or discover.